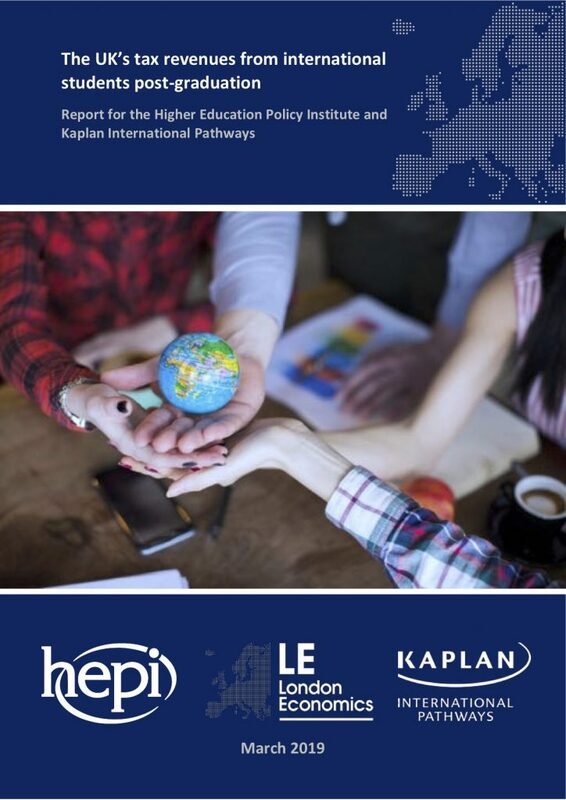 The Higher Education Policy Institute (HEPI) and Kaplan International Pathways (Kaplan) are today publishing new research commissioned from London Economics on the financial contributions of international students who graduate from higher education and stay in the UK to work. nearly £600 million in extra VAT payments. Graduates from other EU countries who stay here to work contribute £1.2 billion and graduates from the rest of the world contribute £2.0 billion. The analysis additionally shows international graduates who find employment in the UK typically do so in sectors that suffer from acute skills shortages. Rather than displacing domestic graduates, international graduates are plugging skills shortages. The study also measures the impact of the Home Office limiting post-study work rights in 2012. This costs the Treasury £150 million each year in foregone receipts – that is, £750 million every five years or just over £1 billion since post-study work was first restricted in this way in 2012. “Universities firmly believe the Government’s biggest mistake in higher education has been to discourage international students from coming here. A hostile environment has been in place for nearly a decade. It is a testament to the strengths of our higher education sector that the number of international students has not fallen, but it is an absolute tragedy that we have been unable to keep up with the pace of growth in other countries. “The Home Office used to say there is insufficient evidence to show international students bring benefits to the UK. We proved this to be false last year, when we showed international students contribute £20 billion a year net to the UK. But, afterwards, the Migration Advisory Committee claimed there was still a lack of evidence to show international students who stay in the UK to work make a positive contribution. “Restricting post-study work rights for international graduates has hampered efforts to attract students to the UK, with the number arriving here growing more slowly than in other countries. Proposals in the Government’s White Paper to introduce a minimum salary threshold of £30,000 would undoubtedly make us even less competitive. This places real risk to the UK of losing the significant economic, educational and soft power benefits this country has enjoyed for many years. In September 2018, the Migration Advisory Committee failed to recommend the creation of a new post-study work visa, at least until there is “a proper evaluation, by us or others, of what students are doing in the post-study period and when they move onto other work permits.” The new HEPI / Kaplan report provides this evaluation by: evaluating whether international graduates are competing with UK graduates in areas with skills shortages; assessing the proportion of EU-domiciled and non-EU-domiciled graduates in sustainable employment in the UK in the 10 years after graduation; considering their median earnings and tax and National Insurance payments; and showing the adverse impact on government revenues of restricting post study work rights for non-EU-domiciled students. The Higher Education Policy Institute (HEPI) was established in 2002 to influence the higher education debate with evidence. We are UK-wide, independent and non-partisan. We are funded by organisations and universities that wish to see a vibrant higher education debate as well as through our own events. For more information, see www.hepi.ac.uk. Kaplan International supports the higher education sector worldwide in achieving its internationalisation and diversity ambitions. We specialise in on- and off-campus pathway programmes for international students and innovative growth solutions such as Transnational Education, online delivery, targeted direct student recruitment, and student residences. For more information, see www.kaplanpathways.com. London Economics is one of Europe’s leading specialist economics and policy consultancies. Based in London and with offices and associate offices in five other European capitals, we advise an international client base throughout Europe and beyond on economic and financial analysis, litigation support, policy development and evaluation, business strategy, and regulatory and competition policy. For more information, see www.londoneconomics.co.uk. the attitudes of higher education applicants on learning alongside people from other nations (2015).